My highschool friend Jane is staying with me in Blois for a few days. It’s quite hot so we’ve decided to cycle late afternoon and dine out. Jane has been cycling in Townsville along the Ross River in preparation for her visit and the day before, we’ve already ridden along the Loire from Château Menars to Saint Dyé sur Loire and back, a comfortable 16 K.
I’ve checked my bike map, Les Châteaux à Vélo, and seen that Bracieux to Chambord is about 8 K, which is perfect. I know the route because I’ve cycled on it before. You may remember that Bracieux is the little town where Relationnel and I were recently dubbed “cute” by one of the locals. We arrive in Bracieux without mishap and take the bikes off the back of the car. We’re organised by now and have everything we need, including our rain capes because there are a few blackish clouds floating around. We ride into the town and check out the 17th century market place. 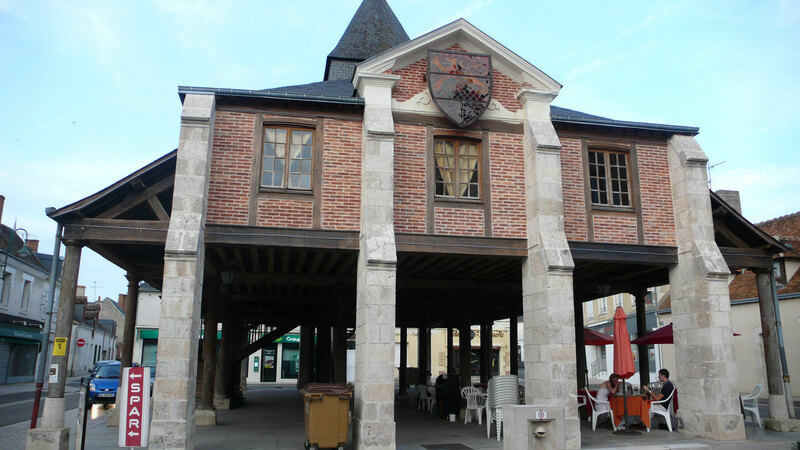 We see that the restaurant on the corner “Au Fil du Temps” is open because the tables under the market place are already set. Off we go and I realise that I don’t know where the bike route is. I hate to admit this, but when I’m with Relationnel, I leave that sort of thing to him. We head off in what seems a likely direction and eventually find a little bike sign saying “Chambord”. “I guess it’s because we already went cycling yesterday”, says Jane after about 5 k, “but it doesn’t seem as easy today”. “Don’t worry”, I reply, “only about 3 K to go”. But we arrive in a town that I don’t remember seeing before called Neuvy. It’s a bit worrying because I can’t see it on my map either. Some other cyclists tell us they’ve just come from Chambord. I see a sign that says 11 K. Oops ! We find a street map and discover that we must have missed a turnoff early in the procedure and have been going east instead of north. Jane looks very discouraged. We head off in the right direction this time, along a forest road, and when we get to the crossroads between Chambord (5 K) and Bracieux (3 K), she decides that we may as well push on to Chambord after coming all this way. We finally get to the stone wall surrounding the castle and enclosing what was François Ier’s favourite hunting domain. 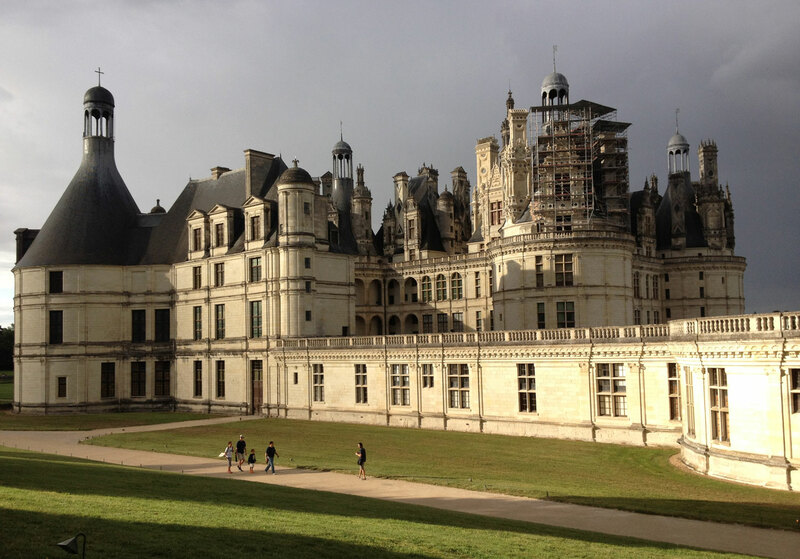 No one ever lived in Chambord – he used to travel with everything and everyone he needed, including furniture. 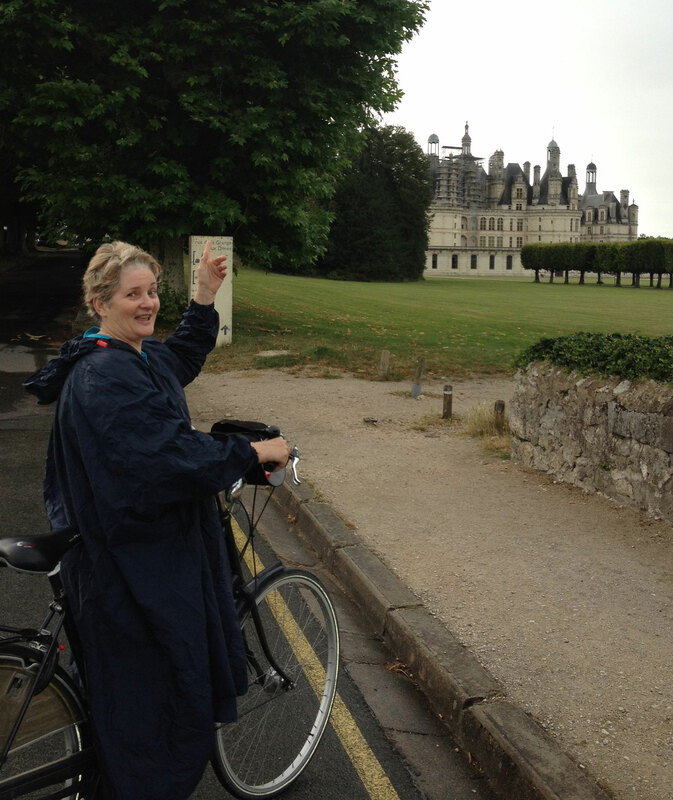 Jane discovers Chambord after a long, hard ride! I miss the cycle route (again!) so we join it a little further on, which seems preferable to cycling along the edge of a 70 kph road. Now it’s spitting. We come out just before the château and as we round the corner, the view is breathtaking. We put on our capes but the sun then comes out and casts a wonderful light on the castle. We cycle through the grounds, past the château and finally stop and have a cold drink at a café with the castle in full view, just as everyone is packing up. By then it’s 7.45 pm but it’s still full daylight. After a suitable rest, we go back along the 8 K route we were originally supposed to take! By the time we arrive back in Bracieux, we’ve ridden 30 K and Jane is understandably very proud of herself as 16 K is her record. We decide to have the full menu for 26 euro at Au Fil du Temps. There isn’t a wide choice, but the entrée (melon for Jane, smoked salmon for me) and main course (fresh salmon for Jane and entrecôte for me) are good value for money. The tarte tatin is somewhat disappointing. The service is friendly, however, and the setting is definitely worth it! 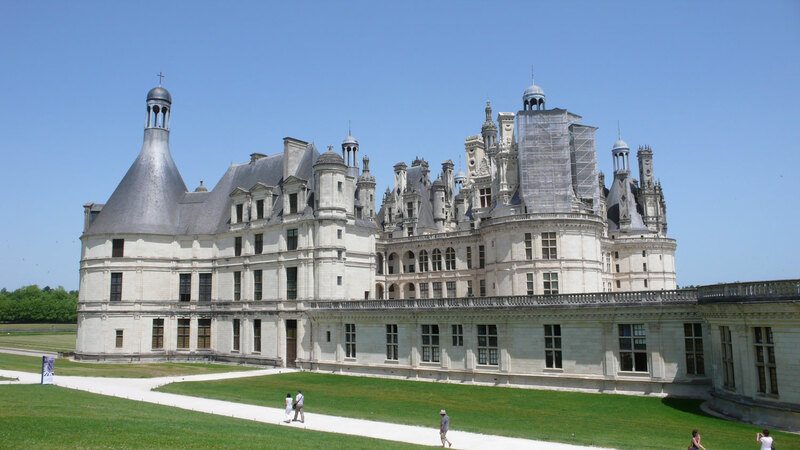 This entry was posted in Cycling, Loire Valley, Restaurants and tagged Au Fil du Temps, Bracieux, Ca, Chambord, cycling in the Loire. Bookmark the permalink. Wow what a day you two have had! Congratulations on your gold medal endurance ride! Don’t think I have ridden a bike since high school when my route was Belgian Gardens to Hyde Park. I wonder if I can still ride?? No doubt you are sharing much fun and laughter not to mention plenty of that wonderful French cuisine…. Sigh! It seems that you never forgot once you’ve learnt! We have been sharing much fun and laughter (and wonderful French cuisine!) and were talking about you yesterday! I’m the Jane referenced herein and I had the BEST day and recommend all that is said! Even the cycle bit was fun if a little tiring by the end but I can see how people get hooked on cycle trips like this. Being with my blog friend here in France is always exciting and we have many laughs. Thanks heaps R. for my lovely times in Blois. As a keen cyclist myself, oh how I envy you! I would love to do a cycle tour in France and the Loire is such flat countryside. 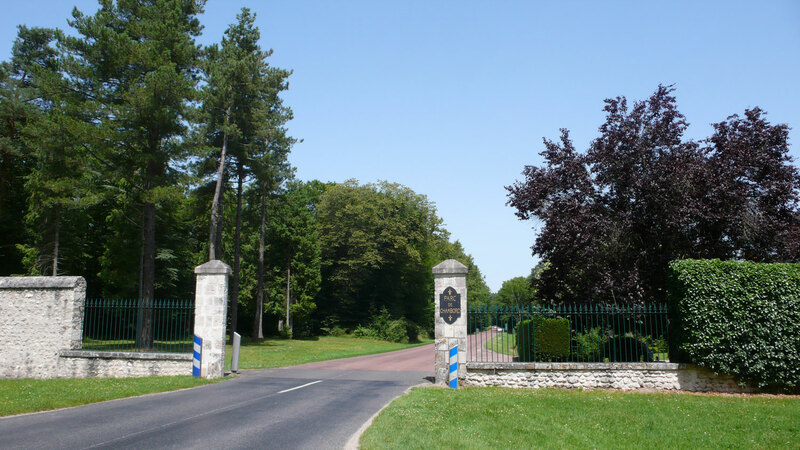 I was a bit confused when I first went there as I thought it was the Loire VALLEY but the hill were far away. Not a valley as I know it with steep sides and river along the bottom. Congratulations to you both on your 30k ride. You should buy a chocolate gold medal and sing your national anthem. Which would it be?? That’s interesting about the valley. I’d never thought about it. The Nile Valley doesn’t have very high hills either! The Loire is certainly lovely to cycle in. Today we were at Chenonceau. I want to cycle to London via Dieppe next year!